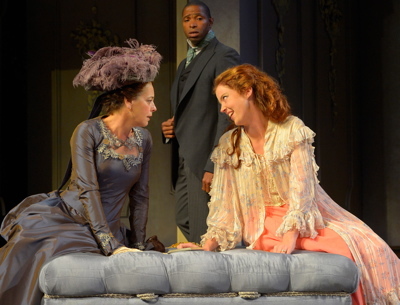 “It takes a good woman to do a really stupid thing.” And Oscar Wilde’s Lady Windermere is a really good woman. “Lady Windermere’s Fan,” in an elegant production at CalShakes in Orinda, Calif., falls somewhere between the playwright’s comedies (e.g., “The Importance of Being Earnest”) and his more serious work like “Salome.” It is funny; with a good number of the zinging aphorisms for which Wilde is famous (“I can resist anything but temptation” is perhaps the best-remembered one). It also has depth and, at the end, one can’t help but wonder who the “good woman” of the subtitle really is. At the outset she is presented as the lady of the title, an innocent, well-bred Victorian lass of the upper class (Emily Kitchens), who is blithely arranging flowers for her “coming-of-age” birthday party. Married to a somewhat older man, who has an annoying habit of calling her “child,” (a somewhat stiff – as the character demands – Aldo Billingslea), she is charming and decorative and something of an airhead. But only at first. Into this delightfully sedate and proper household comes a rumor (by way of an hilarious Danny Scheie in drag) about a certain Mrs. Erlynne, a woman of dubious reputation who has been both visited and financed by Lord Windermere, as well as most of the other blades-around-town. In her shock and righteous outrage – especially after her husband insists on inviting the person to the birthday ball – Lady W. decides to take refuge (or revenge) in the arms of an admirer, the callow Lord Darlington (played in a very callow and mannered manner by Nick Gabriel). But, when her fan is discovered in Darlington’s rooms, it is the notorious Mrs. Erlynne who comes to her aid, even at great peril to her own future. Kitchens is quite good as the sadder-but-wiser young woman of the title, but it is Stacy Ross as the elegant and generous Mrs. Erlynne who steals the show. Ross plays the “fallen woman” with an innate dignity lacking in most of the other characters – particularly the men who make up the bulk of the cast. Among those are, in addition to those mentioned above: James Carpenter as Lord Augustus, Mrs. E’s besotted suitor; Dan Clegg, beyond perfection in the small role of a dissipated socialite; and L. Peter Callender as Mr. Dumby, a man with a personality that suits his name. But it is the women who take the laurels in this show, as they were written to do. A kind of early feminism pervades the beautiful rooms of these over-privileged households (stunning sets by Annie Smart and costumes to match by Meg Neville). The men may think they hold the reins, but it is the ladies who have the brains. Christopher Liam Moore directs at a Wilde pace and the evening goes by in the flutter of a fan. “People are either charming or tedious,” notes the affected Lord Darlington. The same might be said of plays. This one is exceedingly charming.